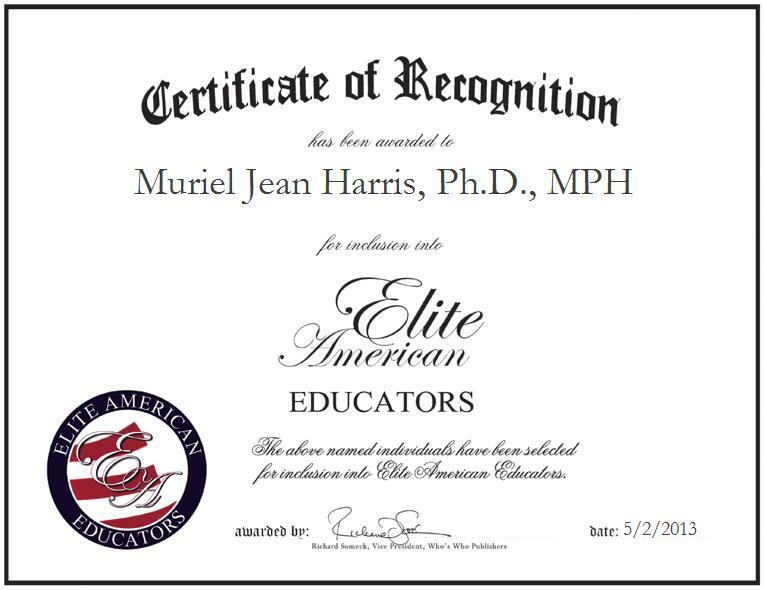 LOUISVILLE, KY, May 2, 2013, Muriel Jean Harris, Ph.D., MPH, Professor for the School of Public Health and Information Sciences at the University of Louisville, has been recognized by Elite American Educators for dedication, achievements, and leadership in public health and education. Dr. Harris has worked as an Associate Professor in the School of Public Health and Information Sciences at the University of Louisville since 2011. She is the author of “Evaluating Public and Community Health Programs,” as well as numerous articles and chapters in her field. She is also a proficient speaker and presenter as a subject matter expert. Dr. Harris has conducted research for numerous organizations and on various illnesses and disorders. She is currently in charge of teaching students obtaining master’s degrees and doctoral degrees, and reviewing evaluations on public health. Dr. Harris became involved in her profession after many of the individuals who tested positive for the HIV / AIDS virus did not seem to understand how they became infected or how to protect themselves. She feels that she has been able to achieve her professional goals due to the educational opportunities with which she has been afforded, and her great mentors.